Judge Terrence Boyle ruled that a lower-level magistrate judge was correct last year in approving the extradition of Inocente Orlando Montano Morales, who is charged with “terrorist murder” in the 1989 killings of the Jesuit priests, most of whom were from Spain. A human rights lawyer who helped persuade Spanish authorities to prosecute Montano applauded. Montano could still ask a federal appeals court to halt his extradition. His attorney, James Todd, didn’t respond to a message seeking comment. 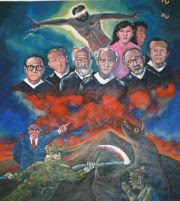 In her 23-page ruling, [U.S. Magistrate Judge] Swank said the evidence shows that Montano participated in the "terrorist" murders and attended the key meetings where the high command plotted the assassination of Jesuit Father Ignacio Ellacuría, the rector of the University of Central America. Montano is elderly and reportedly in ill health. If he continues to fight by appealing this most recent decision, he may not live to see the inside of a Spanish court. Meanwhile, there are little reports of progress in attempts to have a prosecution in courts in El Salvador, despite the removal of the former 1993 Amnesty Law.